Adoption Ambassadors is a shelter program that is similar to foster care but goes a step further. Adoption Ambassadors’ animals typically are happy and healthy. That’s because many of the pets were surrendered to Young-Williams Animal Center by families who could no longer care for them. Some dogs and cats find it hard to adapt to shelter life and often become withdrawn and depressed. Often, all it takes is removing the pets from the shelter and placing them in a better environment – similar to what they were accustomed to – in order to ease the transition to a new home. Becoming an Adoption Ambassador and fostering pets at Young-Williams Animal Center will help children develop patience and understand commitment. Becoming an Adoption Ambassador and fostering pets at Young-Williams Animal Center will help children develop patience and understand commitment. It requires everything from regular feedings to socialization and obedience training. Nurturing and caring for animals teaches accountability and helps develop useful skills, including time management. 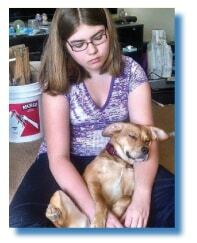 Gaining the trust of these abandoned pets, some of whom were neglected or mistreated, also helps a child’s self-esteem. Children will see math put to practical use as they feed, weigh and medicate animals with adult supervision. They can write in a journal about their experiences with the pet to pass on to the new adopters. Also, a college student can collaboratively care for a short-term pet and have a companion to help them get over being homesick and stressed by school. Additionally, children will improve their social skills. Adoption Ambassadors promote the availability of their dog or cat through creative means, such as social media and homemade signs and by alerting people in their family and community networks. Ambassadors also help maximize the availability and exposure of the pets. For instance, dogs leave with a brightly colored “Adopt Me” vest so that while they’re in parks or other pet-friendly venues, the public will see that the dog needs a forever home. Once an adopter is found who’s a good fit, the paperwork will be processed and presented to the adopting family with their new loving companion – teaching children how to handle formal transactions, along with financial responsibility. As a further reward, your children will know that as a result of their efforts, the animal will not have to spend another day at the shelter. Fostering pets is one of the most rewarding and bonding experiences a parent can have with their kids, making it not only a part of your daily routine, but also a memorable part of their childhood. If you or someone you know is interested in attending an orientation, please contact our placement coordinator, Ashley Thomas, at 865-215-6692 or email athomas@young-williams.org.